A chance discovery of a short article in The Weekly Illustrated Magazine for September 4th 1937 prompted this piece. This periodical was a popular magazine with a high picture count which specialised in quirky stories for its readership, which tended to be from a working class background. 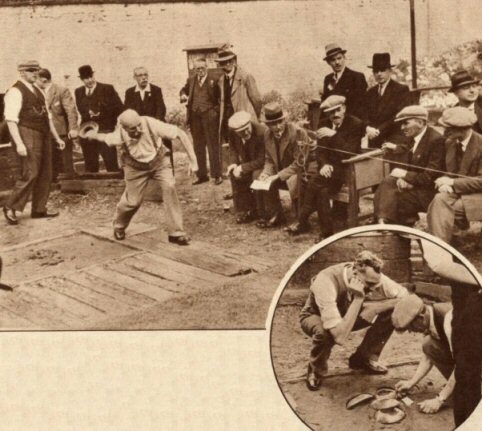 We are informed that the All-England Quoits Championship Final for 1937 was contested between an ex copper and a miner half his age. The picture to the left shows W J Stocks (the article has Stock in error) who is described as ‘a 68-year old ex-inspector of police from Fulham’. He must have been a very fit man for his age as according to the report the game lasted around four hours! His opponent was Isaac “Ike” Cooper a 34 year old miner from Somerset. Judging by the posters to be seen in the background it seems that The News of the World was the sponsor. According to a programme which was issued for what was billed as the 22nd international meeting between Wales and England, at the Betterment Quoit Ground Cwm 1st Aug 1932, Stocks was already crowned the Champion of England. It seemed natural that he was also Captain that day. From yet another programme, again an England v Wales fixture (29th meeting, August 7th 1939 at Barley Mow Sports Ground Ilford Essex – still in existence) we discover that Stocks and Cooper went on to become England teammates. By coincidence I have been reading Arthur Taylor’s excellently written and beautifully illustrated Played at the Pub*. You may recall that Arthur wrote a piece for us last issue. In the book he explains the background of the game of quoits and its connection to the Pub. Arthur tells us that the game is mentioned as far back as 1361 in a document issued by Henry III, in which men are urged not to ‘meddle in hurling of stones….and coits’ (when they should have been concentrating on improving their archery prowess). Leaping ahead to the 1820s it is suggested that by then quoits was arguably as widespread as bowls or skittles in England, Wales and Scotland and that it enjoyed huge popularity as a spectator sport. Since the game was generally parochial the rules for each area varied considerably particularly in the matter of equipment, scoring and throwing distances. It was not until regulatory bodies were set up in the 1880s that some codification was achieved. Nonetheless differences still existed between the regional bodies and although the ‘long game’ prevailed in most parts the North East still maintained a preference for the ‘short game’. The quoits themselves could vary from five to fifteen pounds in weight. The venues were sometimes in parks or village greens or attached to public houses. Incidentally the philologist Water Skeat is of the opinion that the word quoit comes from the Lowlands Scots coit via Old French coiter (to push) meaning to push about, jostle, perhaps in the sense of one quoit pushing another away on landing. Against this background we can see that the 1937 Championship was played to the long game rules (we are told that the throwing distance was 18 yards) and that the quoits weighed between eight and eight and a half pounds each. The venue was in Latimer Road North Kensington but otherwise not specified although one seated gentleman is to be seen with a half pint of mild (?) so perhaps we can safely assume that the pub is close by. The rink or ground is double ended that is to say the players take it in turns to throw at one clay bed and then on the conclusion of an ‘end’ throw at the opposite bed. We are told the beds are four feet square. The aim of the game is to get as many of your quoits as close to the ‘hob’ a small projection proud of the clay bed whilst dislodging your opponent’s. The two men seen pictured in the roundel are known as lighters and it is their job on behalf of their adopted thrower to determine whose quoit is nearer the hob, sometimes using callipers to help them. The unnamed author of the piece explains that ‘in the course of a ding-dong struggle for the championship lasting almost all afternoon they threw more than two tons of metal for three miles’. The scoring was 61 points up. Cooper was pipped by Stocks to the win having led for almost all the match.